The IT world is abuzz with the possibilities opened up by cloud computing. According to a study by research firm Zinnov, the global cloud computing market is expected to cross $70 billion by 2015. Being a top player in the IT field, India cannot escape this global penchant. Thus, it becomes important to understand the potential impact of cloud computing from the perspective of a developing country like India. An organisation ensures that all its employees have the right hardware and software they need to do their jobs. Buying computers for everyone isn't enough - it also has to purchase software or software licenses to give employees the tools they require. If employee count increases, the company has to buy more software or make sure that its current software license allows another user. This is cumbersome and affects costs substantially. Instead of installing a suite of software for each computer, the company can load one application. That application would allow its workers to log into a Web-based service which would host all the programs the user would need for his or her job. Remote machines owned by another company would run everything from e-mail to word processing to complex data analysis programs. Thus, doing away with software installation and licenses reduces costs immensely. This is the basic logic behind cloud computing. 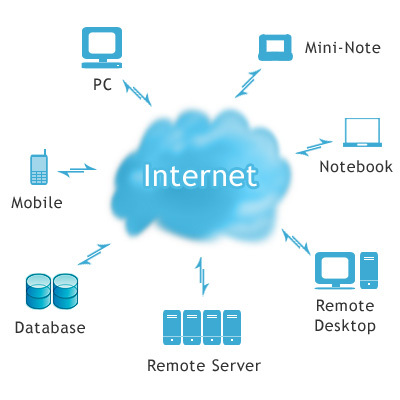 Cloud computing refers to the use and access of multiple server-based computational resources via a digital network (WAN, Internet connection using the World Wide Web, etc.). Cloud users may access the server resources using a computer, netbook, pad computer, smart phone, or other device. 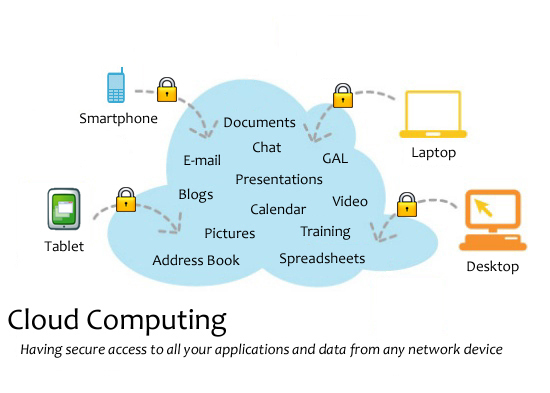 In cloud computing, applications are provided and managed by the cloud server and data is also stored remotely. Users do not download and install applications on their own device or computer; all processing and storage is maintained by the cloud server. The on-line services may be offered from a cloud provider or by a private organization. Thus, in simple terms, Cloud computing means Internet-based computing, where applications and software are accessed over the Internet, which results in reduced IT costs. There's a good chance that most netizens have already used some form of cloud computing. If one has an e-mail account with a Web-based e-mail service like Hotmail, Yahoo! Mail or Gmail, then one has had some experience with cloud computing. Instead of running an e-mail program on personal computer, one logs on to a Web e-mail account remotely. The software and storage for the account doesn't exist on local computer - it's on the service's computer cloud. Who are the Global Pioneers? In 1970s it was extremely difficult for common man in India to get a land telephone line installed at their residence. The whole notion of phoning for help during emergencies was a privilege not available to the common man. Then with the advent of cellular telephone technology, advances in the telephone switching technology, and low cost mass production of cellular phones, most Indians bypassed the land line telephone generation. Within the context of India, this development was disruptive and can definitely be termed as a revolution in the field of telecommunications. Cloud computing may provide similar hope for a majority of the developing countries like India [both individuals as well as small and medium sized companies] to bypass a generation of computing technology. India in 2011 has over a million developers, around 10K system integrators and more than 1K independent software vendors. In the next 5 years, India could see the creation of 300,000 jobs in the cloud computing sector. India will not only see a surge in consumption of cloud services, driving growth in domestic IT usage, but companies all over the world will look to India to support their transition to cloud computing. In June 2010, Software giant Microsoft said IT firms NIIT, Cognizant and CDC Software, and Indian Institute of Science (IISc) will build solutions and train manpower based on its cloud computing platform, Windows Azure. Microsoft has partnered with IT training firm NIIT, which will train over one lakh students on Windows Azure over the next three years. IT firm Cognizant, on the other hand, will develop solutions based on Azure to help its clients implement, migrate and manage their applications on the cloud. Over 4,000 applications have already been built on the Windows Azure platform by India. Companies like Wipro, Infosys, TCS, HCL Technologies and Mahindra Satyam are already building applications and solutions across verticals ranging from healthcare, banking to manufacturing for local and global markets. In fact, in February 2011, Tata Consultancy Services Ltd (TCS) unveiled a subscription-based cloud service for small and medium businesses called iON, which aims at addressing the IT needs of small companies. CDC Software, an enterprise software and services applications provider, also announced the global roll out of its flagship product 'CDC Respond' (a complaint and feedback management application for banking and government sectors) on the Windows Azure platform. IISc, Bangalore, is building a large-scale application on Windows Azure to study the basic resource allocation constructs and strategies required for addressing enterprise needs on the cloud. In addition, India-headquartered global IT solutions organization, NIIT Technologies, and Hitachi Asia (Thailand) have jointly launched a high-reliability Cloud Computing Service, leveraging their respective expertise in Data Center management. India is still a nascent market for cloud computing. There is a $1 billion worth of opportunity waiting to be tapped into but Indian firms are yet to bite. It seems to be a case of partly not wanting to change status quo and partly apprehensions regarding the safety of keeping confidential data on the net. In addition, there is a lack of platform for leading research scientists and industry practitioners to deliberate on latest trends, best technologies and socio-economic approaches towards deployment of cloud computing solutions in India. Moreover, the moment we talk about more people using the internet, we have to adequately ramp up infrastructural facilities. Broadband connectivity is one of the 6 programmes covered under Bharat Nirman which aims at ensuring broadband coverage to all 2.5 lakh panchayats by 2012. However, a serious and dedicated effort to popularize cloud computing will require a greater handshaking between the Government and the IT society. Perhaps the biggest concerns about cloud computing are security and privacy. The idea of handing over important data to another company worries some people. Corporate executives might hesitate to take advantage of a cloud computing system because they can't keep their company's information under lock and key. Privacy is another matter. If a client can log in from any location to access data and applications, it's possible the client's privacy could be compromised. Cloud computing companies will need to find ways to protect client privacy. One way is to use authentication techniques such as user names and passwords. Another is to employ an authorization format - each user can access only the data and applications relevant to his or her job. Some questions regarding cloud computing are more philosophical. Does the user or company subscribing to the cloud computing service own the data? Does the cloud computing system, which provides the actual storage space, own it? Is it possible for a cloud computing company to deny a client access to that client's data? Several companies, law firms and universities are debating these and other questions about the nature of cloud computing. Cloud computing could turn home computers into simple terminal interfaces. In some ways, this is a step backward. Early computers included hardwired user terminals. Each terminal had a computer monitor and keyboard, but they only served as an interface to the main computer. There was no way to store information locally on a terminal. There's a growing concern in the IT industry about how cloud computing could impact the business of computer maintenance and repair. If companies switch to using streamlined computer systems, they'll have fewer IT needs. Some industry experts believe that the need for IT jobs will migrate to the back end of the cloud computing system. As far as India is concerned, the reason why the world may sit up and take notice of India’s immense potential to be a cloud computing is the country’s unique demographics. India has not yet reached saturation point, and there is ample leeway for IT adoption, be it by way of enterprise, the private or the ITES sectors. Moreover, there is the immense SME sector which can now be engulfed into cloud computing. All in all cloud computing is an enormous success story waiting to be scripted in India, and fortunately one is beginning to hear the early rumblings of a giant movement. A country of billion plus people with amazing diversity and skills has mind boggling potential. The cloud computing revolution should begin anytime. In the meantime it is a good idea to be a part of the preparation for the future and companies and institutions that have realized this and have made the necessary moves will get the pioneer’s advantage. Cloud computing time has come, and things should get interesting here onward. Thanks for sharing such a useful information. Today cloud computing has become a face of web application service.